During our second annual Dreamland Resort campout and Tikaboo hike we tried something that had never been done before: A live Internet broadcast from the top of Tikaboo Peak. We were all very excited about this, but unfortunately the equipment did not cooperate, and we had to postpone. Of course we could not give up so easily. 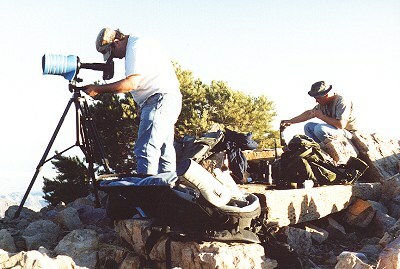 A couple of days later, on Wednesday, September 5, 2001, a few of us hiked up again to give it another try. With me were Gary Sellani and Bill Whiffen, as well as Bills trusty companions "Big Dog" and "Snickers". Besides keeping me company Gary and Bill also provided the hardware needed for the broadcast. Standby in Rachel was Bob Clabaugh, to provide the radio link and to feed the signal into the Internet. As it got dark we watched the lights at Area 51 come on. Very prominent are the bright orange lights at the Janet terminal and the bright white lights at the shipping and receiving facility. A few minutes before the scheduled broadcast time at 8pm PDT we were able to establish radio contact with Bob in Rachel. The best spot for the transmission turned out to be next to a steep drop-off, a few meters to the right of the platform with our telescope. We went on the air, and together we tried to give the listeners an idea of where we were and what we saw. During the first few minutes of our broadcast we watched the last Janet for the day take off from Area 51 and fly towards Las Vegas. Of course Tikaboo is the closest spot on public land to actually see a Janet take off from Groom, and we hope that our excitement watching it take off came across to our listeners. We also described the view of the Bald Mountain surveillance station, Tikaboo Valley, Groom Lake Road and several other interesting features. It was a great experience to share what we saw with the listeners all over the world on the Internet. We could have continued for hours, but unfortunately our transmission time was limited by our battery pack. So I went over to the telescope to pan across the base, and to relay to the listeners what we saw at the brightly-lit base before we had to end the broadcast. Unfortunately at this point the radio link was lost, and the only ones listening to the rest of our transmission were our friends at the base. Consistent with Murphy's law, this is when things got really exciting: Right after we lost radio contact something amazing happened. As we were watching the base through binoculars and my C-5 spotting scope first the blue taxiway lights and then the white runway lights came on. Suddenly the entire valley was filled with lights. Now, watching the runways in daylight is one thing. But seeing the long stretch of lights at night really gives you an idea of the size of the runways, and the entire installation. There were two rows of white lights in the foreground, then rows of blue lights connecting them where the taxiways are, and leading to the base. I had seen the runway lights on before, but this was the first time I saw them through my C-5 spotting scope. It looked like a carpet of lights, suddenly rolled out in the desert. Following security procedures, the lights are only turned on if the runway is about to be used. The last Janet had left already, so we knew something unusual was about to happen. And sure enough, right after the lights came on, around 8.30pm, we saw what appeared to be a small aircraft take off to the south. It was a dark moonless night, and due to the darkness all we could see was the plane's single landing light. The plane did a few slow and very low passes back and forth over the base, and we saw it perform at least one touch-and-go maneuver on the southern part of the runway. Coming from the north it flew low and slow over 2/3 of the runway, passing most of the base buildings, and then still had enough runway left to do the touch-and-go. At some point during the test all runway lights went dark, and came back on after less than a minute. After a few more low passes over the base the plane landed, and the runway lights went off just as the moon was coming up over the mountains. No more activity was observed after that, except for some flares and live bombing runs far in the distance, probably Range 65 near Indian Springs. The flight test was accompanied by an unusual activity of ground vehicles. We saw a convoy of four vehicles drive south, then southwest, on the road leading past the ammunitions storage facility and to the engine test cells at the far south end of the base. Also, the northeastern hangar of the four so-called Red Hat Hangars (hangar 5) was lit from the inside and we saw bright lights in the area of the shipping and receiving facility. We assume that the short window between the departure of the last Janet (with lesser clearance personnel) and the moon rising was chosen to prevent any details of the tested aircraft from leaking out. Also, it was flying so low that it would have been impossible to see even from the Powerlines Overlook. Only Tikaboo has a good enough view to even see the craft at all. We don't know what it was, but as I said earlier, it appeared small and was flying very slow. It seemed to be able to do fairly tight turns, and its flight characteristics reminded me of a light Cessna. During the entire test the dim landing light was on, which seems to indicate that it was visually tracked. We did not hear any sound from it, which is not surprising at 26 miles distance. I am not an aircraft expert, but all the above observations seem to indicate a new UAV in a fairly early stage of development.